You may have noticed that it has been a bit quiet around here in the last few weeks, and there are a number of reasons for that. Once again we have embarked on way too many things at once, which is something we tend to do way more often than we should. Although these developments are really exciting, it hasn't left us with much time or energy to do much else. Throw Christmas into the mix and it just gets chaotic. Yep, we decided that we were nearing the desired two year age gap between kiddos and that we needed to get a move on! Bubba #2 is due to arrive on the 25th June 2013. Right now I am 15 weeks along, and I have been blessed with no morning sickness again for this pregnancy, I don't know what my deal is but it may have been inherited from my Mum who had no morning sickness in 4 pregnancies. One thing I am feeling this time round is absolutely EXHAUSTED, and of course having a toddler around doesn't help matters in this department, and for some reason day naps have become almost impossible for me, I used to be a pro day napper. Now that the first trimester is over I feel like I have my head a bit more together and have the energy to think and plan! I thought I would use this energy to do a silly photo shoot to announce our new family member. These pictures make me laugh! I love my family, we try not to take ourselves too seriously. Happy New Year everyone, I hope 2013 brings lots of joy and unexpected blessings!! I'm linking up with Essentially Jess for #IBOT, and head over and check out the new members of the IBOT team, I may just be one of them!! 38 comments on "Did somebody say Baby? " WOW! Congratulations! I just love baby news. I love your photo shoot too, very cute! A woohoo! How absolutely exciting! Congratulations to you all!!! LOVE the way you have announced it in pictures!!! What a great memory to have when your children are older!!!! :) Something to look back on.. Congratulations!! What wonderful news :) I love the way you made the announcement, totally cool. My first Grandbaby is due on the same day! Congratulations - what a clever way to announce. I came over from IBOT. Congrats on the pregnancy and I hope the exhaustion eases up for you soon. Baby news is the best! And I love your photo shoot! All the best with the pregnancy...hope that exhaustion eases up soon! Congratulations on your pregnancy. How exciting new baby. hope the rest of your pregnancy is trouble free. Have a happy new year. Thanks Sophie! We are pretty excited!! Thanks Rachel! I've heard a two year age gap is pretty good, pending all going to plan they'll be 22 months apart. I can handle that I think! 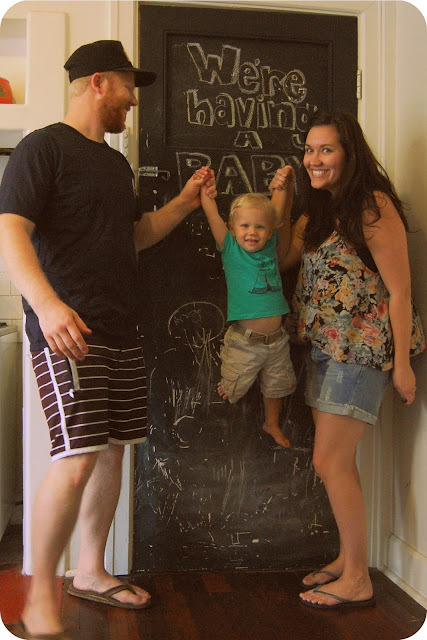 The chalkboard door is a sneaky way to disguise a gross door, but I love it!! Thanks Yvette!! Oh how sweet, thanks Emily!! Thanks Hollie! Happy New Year to you too! Hope it starts and ends well! Love the photos, and congratulations - 2013 is going to be great! 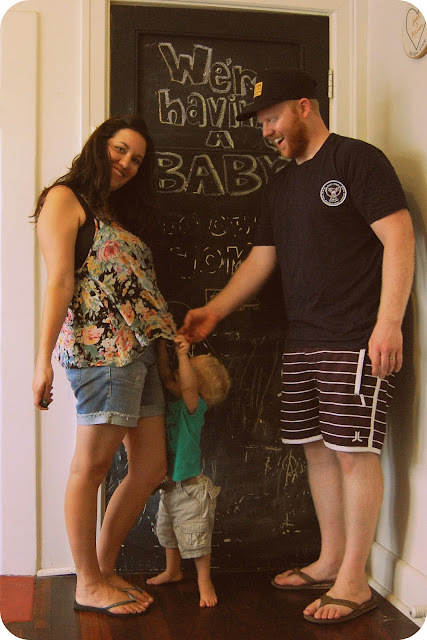 Congratulations on your wonderful baby news and for becoming a member of Team IBOT - 2013 is certainly going to be a big year for you and your family - all the best for it! Oh how exciting! 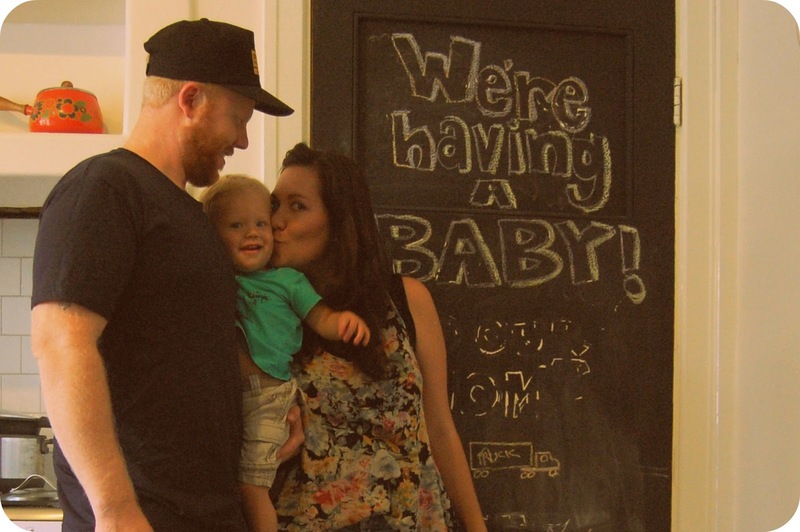 Are you going to be Grandma, Nanna, or something else? It has gotten a little better in the last couple of weeks, but it would feel nice to feel on top of things again! Thanks!! Congratulations!! What a great time to announce - looks like 2013 has a lot in store for you! Thanks!! Exhaustion is easing, just if life would slow down a bit too! ha!! Happy New year! Thanks, it's exciting for sure! Happy New year! It really will be a great year, I'm looking forward to it! Thanks! THANKS! It is going to be HUGE!!! Happy New Year!! I couldn't think of a better time!! Thank you!! Yay I'm excited about being part of #teamIBOT...!!! Thanks! Oh congratulations! That is awesome Karen! Yay!